This is a very common problem. Minoxidil often contains alcohol and it is the alcohol that causes an itchy scalp. "Common side effects of minoxidil include burning or irritation of the eye, itching, redness or irritation at the treated area"
"Alcohol and propylene glycol present in some topical preparations may dry the scalp, resulting in dandruff and contact dermatitis. Some formulations of minoxidil substitute lipid Nanosomes in order to reduce contact dermatitis from the alcohol and propylene glycol vehicle." Dermarolling highly enhances the absorption of Minoxidil and that likely increases its side effects but the main problem is the alcohol or the other substances that the Minoxidil formulation contains, not dermarolling or your dermarolling technique. Dermarolling / Microneedling / Re: To Sarah: What would you recommend for my skin? Having completely wrinkle-free skin at your age is very rare. I also thought you were in your twenties with post-acne problems. I recommend a 1.5 mm dermastamp with 35 needles for your scars (you have just a few). For general skin tone and texture, use a regular 0.5 mm dermaroller and roll up to three times a week. The redness of you face, is it from Tazorac? If your skin "likes" dermarolling, you can later add a 1.5 mm dermaroller but first try just the dermastamp and the 0.5 roller. I am sorry I have not replied yet. I was too busy. I will reply soon. Dermarolling / Microneedling / Re: Do dermarollers/dermstamps help to get rid of old, white stretch marks? There has never been any confiscation of Infadolan in Canada, and we have thousands of Canadian customers. I think it is a small scar but it certainly does not look terrible. Sometimes the more you do with the skin on the nose, the worse it gets because the nose skin is more prone to heal with scars. If it is not residual inflammation, the redness can be melanin pigment. Melanin is normally present in the skin. The skin sometimes reacts to injuries by overproducing melanin in that area. In that case, you can try hydroquinone but you must apply it for a long time because it only reduces formation of new melanin, it cannot remove existing melanin. The most effective for stretch marks is the combination of a regular 1.5 mm dermaroller + a 1.5 mm dermastamp with 35 needles + our 0.1% Tretinoin cream. You can also read there my article about what kind of results to expect. In some cases, a 2 mm size dermaroller and 2 mm dermastamp can be used but I do not recommend them for beginners. In addition, the skin on the arms is quite thin so 2 mm size in not necessary in your case. In your case, I do not recommend the single needles because they are almost 2 mm long and some of our customers got bruises using them on the thin skin of the upper arms. Buy NUROFEN rapid capsules or NAPROXEN capsules. They both contain a nonsteroidal anti-inflammatory substance. Pierce a capsule and apply a little of the liquid regularly on the scar overnight. Do not apply it right after stamping, start a day after. If the redness is caused by residual inflammation, it can help. How old is the scar? Dermarolling / Microneedling / Re: Can a dermaroller cause more scars? My honest answer is that I have no idea why this happened. No, I do not think you did it too roughly. I have been using the single needle on the wrinkles between my eyebrows ("elevens") with great success (I've never been "Botoxed"). I needle the lines and they stay red for a day or two. The lines are still visible from a close distance but they filled in substantially over the months of regular needling and became much less visible. If you are our customer, we can send you the single needles for free but I am concerned that in your case it could make the lines go red again for a long time. You could try the tape method (some of our customers employed it successfully). Stick the tape to the wrinkles and pull the skin up with the tape. Repeat it several times during one session. However, this could also make the lines red for a long time in your case. You can try applying Tee Tree Oil on the wrinkles and keep it there for an entire night. It has a mild anti-inflammatory effect so it may improve the redness. Start with diluted Tee Tree Oil (dilute it with a little extra virgin olive oil for example). Did you have any issues with the skin on your hips after dermarolling? If you remove the flakes gently, it should be OK. Many studies showed that Minoxidil works but the hair will go back to its original state when you stop using it..
Also: You can expect improvement but no miracles. Good luck to you and let us know your results! Honestly, most of our customers would love to have your skin. You have a nice skin tone and do not seem to have scars or enlarged pores. Your photo is enlarged so in reality, your pores are really small. The only small imperfection I can see is on your nose. As you already know from your own experience, the skin on the nose is unpredictable in healing. You can try a 0.5 mm dermastamp. You have to start gently. Do just one stamping into the scars. If it heals well, do two stampings the next time. If it heals well, do three stampings the next time etc. For pigmentation, use our 0.025% Tretinoin cream and apply every second day (without dermarolling). 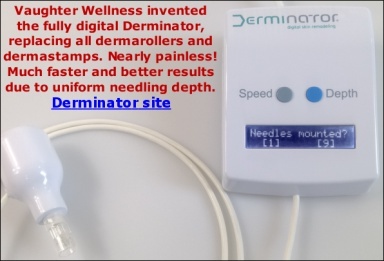 You should add a 1.5 mm dermastamp with 35 needles to your dermarolling (stamp just the scars). Apply vit. C on the days that you do not apply Tretinoin. You can re-start a day after rolling/stamping but only if the skin is not "raw" from dermaneedling any more. Apply vit. C for at least three consecutive days before stamping. You can either stop Tretinoin on these days or wait for vit. C to be absorbed and then apply Tretinoin. If you get no improvement with your 1 mm dermaroller and a1.5 mm dermastamp in six months, add our suction pump and use it on your rolling type of acne scars. The rolling type of acne scars are often tethered to the underlying structures and that makes the scar depressed. In the morning, apply a moisturizing cream of your choice. If your post-acne pigmentation does not get better, start applying Tretinoin three times a week after rolling with a 0.5 mm dermaroller but not everybody can handle this because dermarolling greatly enhances the penetration of skin products and Tretinoin can be quite irritating. When the stitches have been removed, follow the instructions of your surgeon for "scar management". It usually involves pressure massage. Every day you'll apply pressure with your fingers onto the scar for approx. 20 seconds, spot by spot. A scar typically suffers from a reduced blood circulation and applying pressure will expel deoxygenated blood, allowing fresh oxygenated blood to flow in. This pressure will thus mechanically prevent the formation of a hypertrophic/raised scar. The scar will improve significantly during the months after surgery. The dermis will heal in about six to eight weeks. Keep the scar moisturized. You can use our Infadolan ointment. After six to eight weeks, you can start microneedling. Buy a 1.5 mm dermastamp with 35 needles and stamp the scar densely every three weeks. If the scar is thick and hardened, apply our Tretinoin cream right after stamping and massage it in. Wait for several minutes and then apply our Infadolan ointment on top of Tretinoin. In between your stamping sessions, apply Tretinoin three times a week (without stamping) and Infadolan every day (just a little to keep it moisturized). Dermarolling / Microneedling / Re: Read all information! So confused which roller to buy! agh! For red spots, use a regular 0.5 mm dermaroller, roll up to three times a week. You can also try our 0.025% Tretinoin cream. For acne scars, a 1 mm dermastamp. Do not roll or stamp over the botoxed area for the first two weeks. It can take up to two weeks for Botox to maximally paralyze the muscle (by blocking the receptors on the muscle). If you have questions after reading it, just ask.